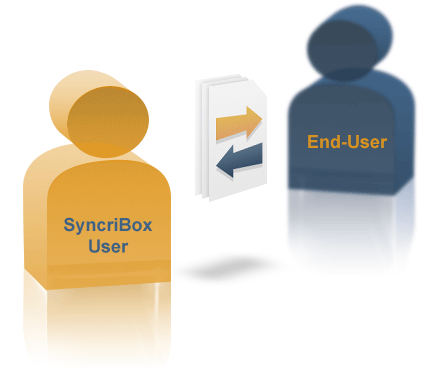 A SyncriBox user wants to send or receive large files from someone on the Internet. 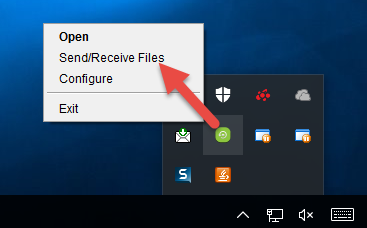 Notification emails are sent to SyncriBox user when files are transferred. Following steps demonstrate how to send large files to users on the Internet. Click Send/Receive Files item in the popup menu for SyncriBox in the Task Menu. Fill out the fields in the next Window. Fields appearing in BOLD are required. Following table describe what each field mean. Name of the person you need to send/receive files. This name is used in notification emails. Email address. Multiple addresses can be separated by a comma. Use this if you wish to protect the URL with a password. You must convey the value of this password using some different mechanism to the end-user. For example, by letting them know via phone. The value for this password will NOT appear in the email containing the public link. 2 - Uploaded files will be removed from the server. If checked, emails will be sent to the end-user. 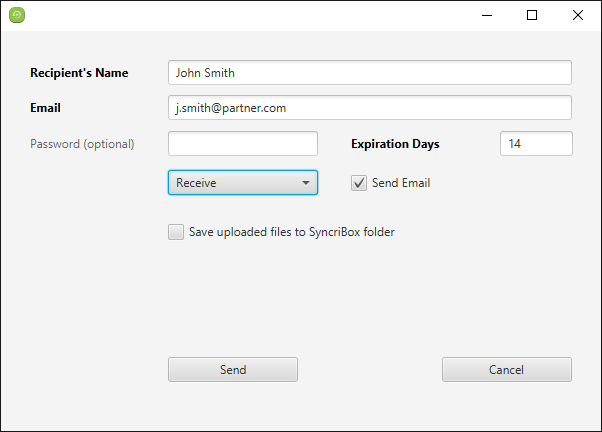 Additionally, the SyncriBox user will get notification emails when files are downloaded or uploaded by the end-user. Drag-and-drop files from Windows File Manager (Finder on Mac OS X) to add files. Receiving files is similar to sending. When this is checked, files uploaded by the end-user will automatically be pushed to the user's computer through SyncriBox. SyncriBox user must download the uploaded file from Syncrify Server manually if this box is not checked. Several emails are generated when public links are used. 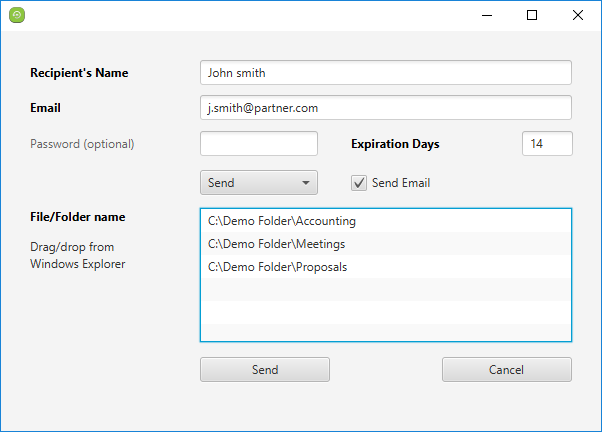 The contents of these emails can be customized by the administrator by modifying one or more template files. These template files are stored in the $INSTALL_DIR/config folder and the names start with the word PublicLink. The <TITLE> tag is used to compose email's subject. The HTML code can have the following variables, which will be replaced by actual values at runtime. Variables must be enclosed by two ## signs. End-user's name, which is used in greeting as well as in the subject line. Represents the IP address where the end-user is downloading the file from. This is used to draw table rows and columns containing file name and size. The number of rows represent the number of files uploaded or downloaded. File names separated by a comma. End-user can optionally write a comment when uploading files. This variable will contain those comments. Name of the App/Folder name for SyncriBox. Following table define the purpose of template files. Used when an email is sent to the end-user inviting them to upload files. Used when an email is sent to the SyncriBox user after the end-user uploads one or more files. Used to invite an end-user to download files. Used after an end-user downloads one or more files. A plain text file is saved in the SyncriBox folder containing the description of who and when were these files uploaded. That text file is based on this template file.